Daryl Murphy bagged his second and third goals for Ireland in tonight’s win. Being congratulated by his team-mates. DARYL MURPHY REPAID Martin O’Neill’s faith in him with the two goals that clinched Ireland’s win tonight. The Waterford-born striker, now 34, has never been prolific in a green jersey and took 24 caps to get off the mark in the 2-2 draw with Serbia a year ago. However, Murphy has proved a competent goalscorer at Championship level over time and came into the game on the back of six league goals for Nottingham Forest this season. And he produced the goods on his 30th international — volleying past Moldova goalkeeper Ilie Cebanu on two minutes before adding a second by finishing off a great move involving Stephen Ward and Wes Hoolahan midway through the first half. “We work on things like that in training [the throw-in] and it’s come off today,” Murphy said of the first goal. “It was a nice early goal as well to settle our nerves and ease our way into the game. 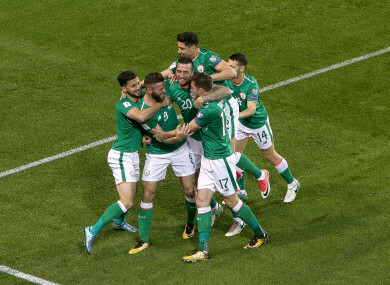 Martin O’Neill opted to withdraw Murphy for Harry Arter with 11 minutes remaining, meaning he was unable to bag the first Irish hat-trick since Robbie Keane’s on his international farewell against Oman in August 2016. Ireland began brightly and although they didn’t match their first half display after the interval, it was a case of job done. Attention now turns to the trip to Cardiff and, with qualification still up for grabs, Monday night promises to be a special occasion. The main thing is that we won,” Murphy said. “Going into the game tonight, that was what we needed. We did that and kept a clean sheet as well so that’s a bonus. Email “Ireland's man-of-the-match finally finds his goalscoring touch in a green shirt ”. Feedback on “Ireland's man-of-the-match finally finds his goalscoring touch in a green shirt ”.